The FP1 admixture is designed for SIRCONTEC polystyrene concrete production. It is dosed into mixing water in the MS 1000 machine before adding cement. 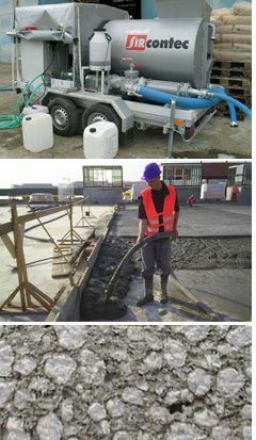 It forms air bubbles in cement milk and supports incorporation of polystyrene beads creating a homogenous mixture which can be pumped to the place of processing/installation easily. The FP1 air entraining admixture meets requirements of standards and regulations valid in EU. SIRCONTEC delivers FP1 in 30 kg plastic canisters, 190 kg drums or 1,000 kg tanks. Specific technical information on FP1 can be found below in the Download Documents part.